Heading into their fourth-quarter results, two of the largest pure-play 3D printing stocks — Stratasys (NASDAQ:SSYS) and 3D Systems (NASDAQ:DDD) — continue to have multiple, strong, positive catalysts. There are signs that these catalysts are taking hold and will positively impact the companies’ upcoming Q4 results, further pushing up SSYS stock and DDD stock in the wake of their results. DDD is slated to report its Q4 results today after the market close, while SSYS is scheduled to report its Q4 results on March 7. On its Q3 results conference call, Stratasys noted that it was seeing a “gradual” acceleration of the use of its products by aerospace companies. The company also cited giant defense contractor Lockheed Martin (NYSE:LMT) as one of its customers. Importantly, the defense/aerospace and healthcare sectors are both extremely large, lucrative markets. Moreover, given the sectors’ need for precision, their highly intricate parts, and their need to frequently change parts due to intense use, the companies of both sectors seem like ideal customers for DDD and SSYS. Assuming that the companies’ growth in those sectors was stable or accelerated last quarter, I think that their results will beat analysts’ expectations, given the seasonal strength of Q4 and analysts’ general pessimism towards 3D printing stocks. As a result, both DDD stock and SSYS stock are likely to rise in the wake of their Q4 results. There are multiple signs that both of these 3D printing stocks should benefit from the companies’ ongoing turnaround. In Q3, Stratasys’ operating income reached $3.4 million, versus a $6.9 million loss during the same period a year earlier, while its EBITDA jumped to $14.7 million from $9.4 million. Furthermore, its Service Revenue increased 10% YoY and its consumable revenue rose 3% YoY, indicating that its customers are starting to use its products more. Over time, that should lead to higher product revenue as products that are used a great deal are replaced by newer products. The company’s consumable revenue should then rise as its customers buy more consumables to use in conjunction with their products. As for DDD, its printer revenue surged 17% YoY in Q3, while its software revenue jumped 8% and its materials revenue rose 2%. Thus, DDD appears, like SSYS, to be entering the beginning of a virtuous cycle of its razor-and-blade model. And in another sign that these two 3D printing stocks are beginning a turnaround, research firm Piper Jaffray at the end of January upgraded SSYS stock and DDD stock to “overweight” from “neutral, The Fly reported. Piper analyst Troy Jensen, a veteran watcher of 3D printing stocks, wrote that his checks indicated that “direct sales of production systems were strong in Q4,” while “overall 3D printing demand is improving,” The Fly stated. Finally, Jensen contended that 3D Systems’ “product positioning” has rebounded. The analyst set a $31 price target on SSYS stock and a $17 price target on DDD stock. As of this writing, Larry Ramer owned shares of DDD stock and SSYS stock. 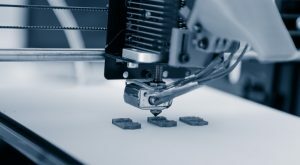 Article printed from InvestorPlace Media, https://investorplace.com/2019/02/3d-printing-stocks-poised-to-advance-ssys-stock-ddd-stock/.